We all just got back from our respective trips abroad ... one came back from her exciting F1 trip in Singapore, another gave birth to her second baby after staying in Canada for 8 long months and I'm still experiencing a major hangover from my Uniquely Singapore Trip. Thus, despite the fact that Metro Manila was declared to be under typhoon signal #3 this didn't stop us from meeting up for a relaxing night with good food and a wonderful company. It was a unanimous decision to meet at Arya Persian Restaurant that evening with both friends declaring how much they love Arya and I just couldn't agree more. I love Arya's lamb dishes and the moment the menu was handed to me, I knew right away which page to flip to. 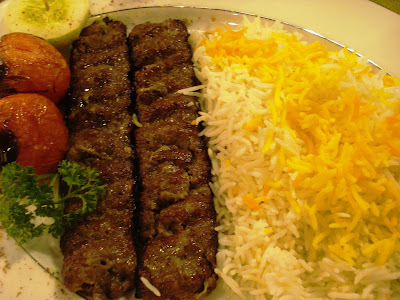 It was a toss between the Bareh Koobideh and the Bareh Shish. I would also have wanted to try the spicy Lamb Biryani but since I was coughing that night, I opted to just skip the spicy dishes so as not to worsen my poor sore throat. Finally, I made my choice and it was the Bareh Koobideh (Php. 375) for that evening. This dish comes with two long sausage-type of ground lamb seasoned with spices and onion and accompanied by a generous serving of flavorful basmati rice (or it can also be served with jasmine rice or persian bread as well). Didi and I both love the special tomato salsa that they can easily whip up for you using the two huge grilled tomatoes that comes with each dish. Without wasting any minute, I requested our friendly server to prepare this for me the moment my plate was laid on the table. I'm a huge fan of lamb dishes provided that it was cooked properly and does not in any way omit any weird smell. So far, Arya has one of the best lamb dishes in the metro. In addition to our individual plates, we ordered a basket of pita and some Hummus (Php. 135) to share. Sab who's not really a fan of chickpeas was still adventurous to give it a try! Hooray! 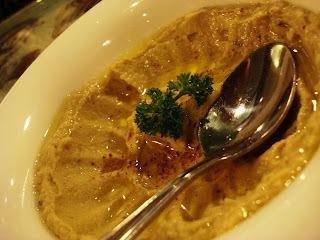 I love Persian dips especially Hummus and Motabal which goes perfectly well with warm pita bread. It's was a perfect way to start our meal while we were busy catching up on each other's lives. Arya Persian Restaurant has branches at Unit L-9 Promenade Mall, Greenhills, San Juan / GF Podium Mall, ADB Avenue, Ortigas Center / 2nd level Robinson's Manila (Midtown Wing), Ermita, Manila. Hi Franny! we love Arya too. We love, love Persian food! :-) And Arya is one of the few Persian places that serves the food right. A must try is the Persian bread. It's soft, succulent and oh so delicious! btw, i'm having another cooking demo for yummy next week at robinsons supermarket in midtown (rob manila) and on the 28th in galleria :) hope to see you there!! this is my favorite Persian restaurant along with Hossein Persian Kebab! I have only tried Arya once, and just for a short snack, warm pita bread with their spicy curry dipping sauce? Loved it! I have to go back there and try the other dishes.